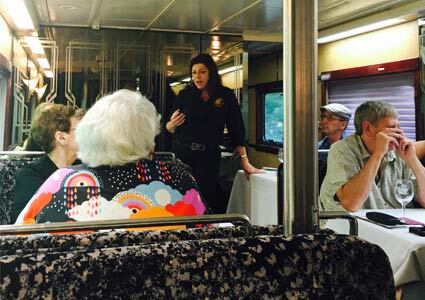 On Saturday, August 20, 2016, the Upper Hudson Valley Wine Trail combined forces with the Saratoga-North Creek Railway for the first ever Wine and Rails Festival. I was so intrigued when I heard of this event. It combined two things I am passionate about, locally sourced food and wine and the Adirondacks. Add to that the Saratoga-North Creek Railroad, something I’ve heard a lot about, but had never experienced, and I just had to go. 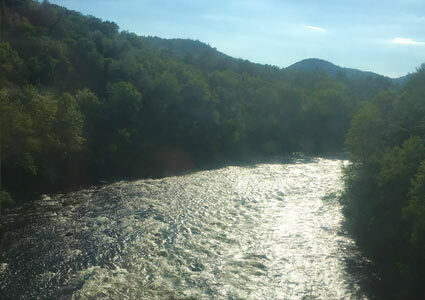 I boarded the train in Saratoga so I could fully enjoy the experience, although there were seven stops along the way I could have boarded the train. This event, like a great bottle of wine, is best enjoyed with a group of friends. I had the good fortune to be surrounded by a lively group, some friends I’ve known for years, and some I got to know on our journey. I was pleasantly surprised to find a beautifully appointed rail car with attractive, comfortable seating with tables in between. Some of the rail cars included food and beverage service, however, ours did not. Next year, I will be sure to select the option that includes food and beverage. If you are the type of person who needs to find the shortest distance between two places, the railway is not the way to go, however, I encourage you to change that mindset. It gave me pause to remember the poem by Robert Hastings, The Station. The journey, in this case, took our group through some of the iconic towns that truly showcase the exquisite landscape of the region. Throughout our excursion we laughed, shared stories and thoroughly enjoyed each other’s company. Every few minutes, we were treated to vintners stories of the land and the wine produced and we were able to sample the fruits of their labor. 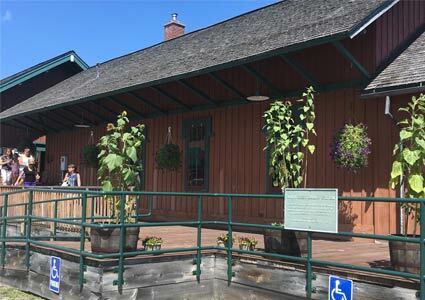 We arrived at the North Creek Rail Station and disembarked close to the Rail Museum and Gift Shop featuring wares from Adirondack craftsmen. After enjoying the comfort station and museum, we walked to an adjacent building where local wineries, breweries, distilleries and food purveyors sampled their creations. In the true spirit of camaraderie, many of the beverage producers collaborated with local cheese and chocolate producers to gift the visitors pairings of food and beverages. 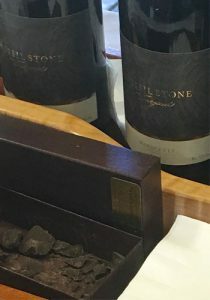 My favorite pairing was the Marguette, a red wine from Fossil Stone Vineyards, paired with the dark chocolate from Barkeater Chocolates. The dark chocolate prepared the taste receptors on the tongue for the full bodied red to produce an incredible taste sensation. 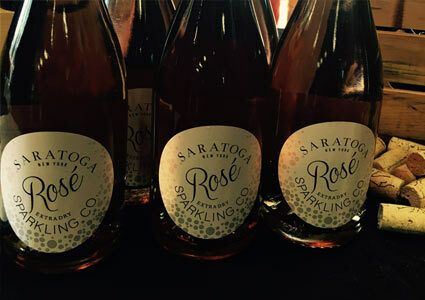 For me, the other stand out wine was the Saratoga Sparkling Rose. It was crisp and dry and did what a good sparkling wine is expected to do, stimulate your taste buds. My taste buds had a slightly unconventional response. There was a food truck that offered many tempting offerings. I chose the sweet potato fries. They were probably the best I’ve ever had, crisp on the outside, warm and tender on the inside and perfectly seasoned. The clear winner for me of the non-wine beverage vendors, was the small batch whiskey from High Rock Distillery, based in Ballston Spa. I have toured their distillery and met with the owners and they are committed to producing quality local libations. When I toured their facility, they were sold out of the whiskey, so I was eager to taste it at this venue. I was not disappointed. I was compelled to purchase a bottle. As part of our day in North Creek, we were encouraged to visit the town of North Creek. We chose to walk into town, however, there was a shuttle from the festival to both the town of North Creek and nearby Gore Mountain to ride the Gondola. 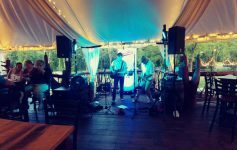 Our entourage settled in at the Barking Spider and we experienced true Adirondack Hospitality. Some of our group ventured out to the Topps Market and returned with a feast for our rail passage back to Saratoga. 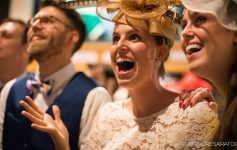 As with the “first” of any event, there were opportunities for enhancement of the experience. From my perspective, I would suggest that the organizers clearly inform guests of the itinerary of the day and the options available on the train. As charming as the historic festival venue was, I’m hoping next year, the venue will expand to include outside tents and additional food trucks to facilitate a smoother flow. 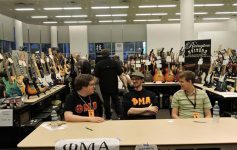 Will I go again next year? Absolutely!!! And I hope to expand my group so I can share the incredible food, beverage, Adirondack hospitality and the breathtaking landscape with even more of my circle of friends!